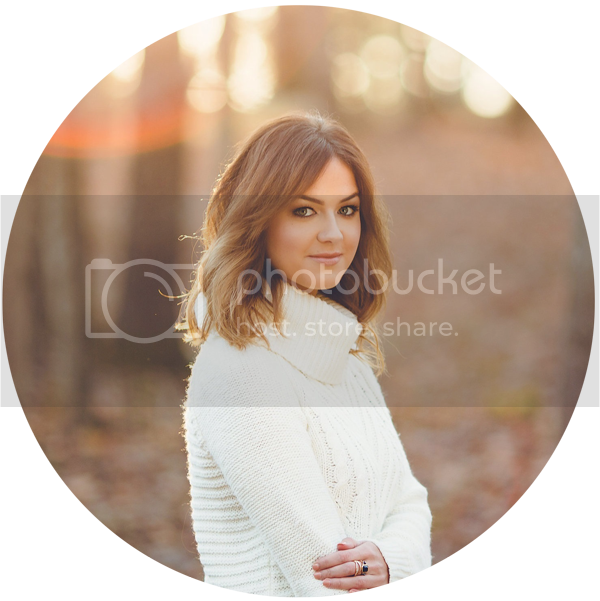 Love, Shelbey: So...I forgot my makeup. Hey everyone! I'm writing a little late into the week because I went out of town last weekend for Will's birthday and didn't have time to write ahead and schedule posts for this week (slacker moment). Speaking of me going out of town, you know that gut wrenching feeling you get when you realize that you've forgotten something back at home? Especially that feeling when it's something you don't go a day without using.... that's right, I forgot my makeup. Now, I could have easily went the weekend without wearing makeup seeing that I was only at Will's house and no one really cares if I wear it or not, BUT, being the OCD/addict I am, I began to collect these crazy thoughts in my head that would involve me to have to wear makeup : "What if there's a wedding we have to go to?!".... "What if I get captured in a ton of close up birthday party pictures?!" WHAT IF, WHAT IF WHAT IF! 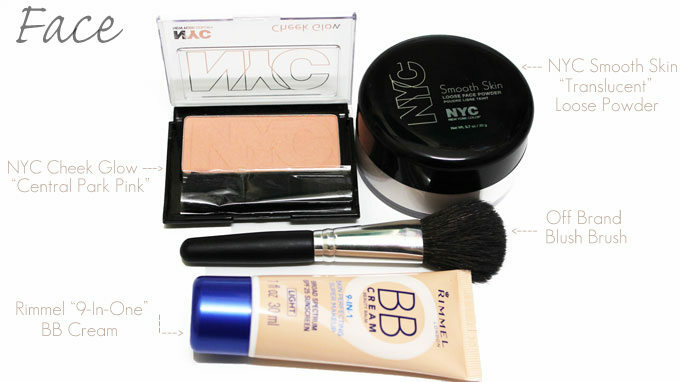 So, I took it upon myself to splurge on some cheap-o drugstore goodies. Some products I bought off recommendation of EmilyNoel83 and some I bought solely because they were dirt cheap. Obviously all of these products were bought on a whim (all at Walmart by the way). The Rimmel BB Cream was a pick I chose because of Emily of Beauty Broadcast on YouTube. She recently reviewed it and had mentioned that it was one of the most inexpensive BB creams in the drugstore AND that it gave the most coverage. She was definitely right! I paid around $6 for it and I was amazed at how well it evened out my complexion, plus it actually gave me coverage! I knew I needed a good multi-tasking brush so I was browsing the small makeup tools section and came across a midsize blush brush which looked like it would be great for applying the blush along with the loose face powder. It worked great! Again, I was surprised. As for eye products, eye shadow and liner really isn't an every day essential for me, I can do without it if needed. So, I picked up a mascara I had seen advertised on YouTube a couple of nights ago called the Voluminous "Buterfly" Mascara by L'oreal. I was so excited to try it. 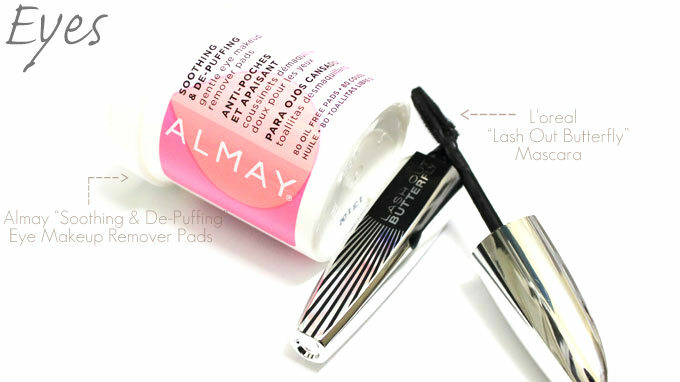 The wand is really unique and looked as if it could really give the lashes some great volume. However, I wasn't astounded by it. Honestly, I probably would have been better off going with a NYC or Covergirl mascara. Since I only used it once, I don't want to bash it on the spot but it didn't leave me with a great impression. 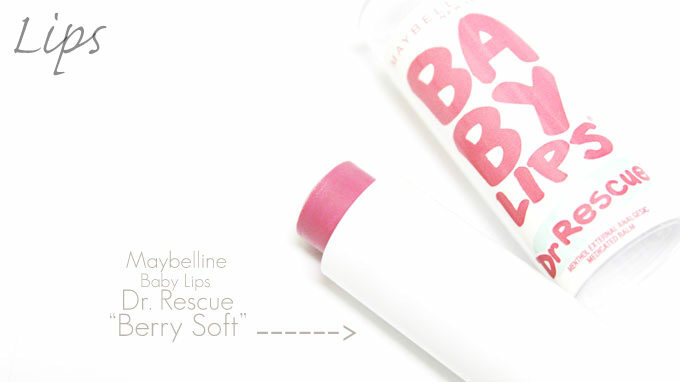 Lastly, I scooped up a couple of the new Maybelline Baby Lips Dr. Rescue "Medicated" Lip Balms. I didn't exactly need them but who can deny a new Baby Lip?! I love them! They have a slight menthol scent but nothing too overwhelming. 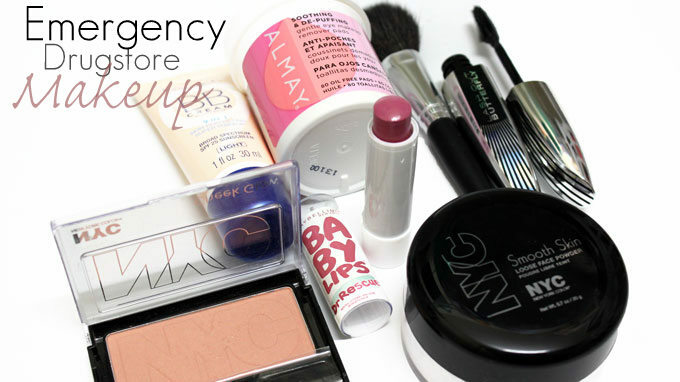 Have you guys ever forgotten your makeup bag when you travel?